We know sometimes being an educator can feel like a thankless job. But we've been there. WE thank you. Now we'd like to ask if you could possibly thank us back! Internet4Classrooms.com has an earnings partnership with a list of online vendors including AMAZON.COM. It's similar to any school percentage fundraiser - take for instance, Box Tops. Go to the following address:http://astore.amazon.com/internet4-20 - I4C's shopping page. Add the item to the shopping cart. Continue searching and adding items (each time starting on the I4C associates page:http://astore.amazon.com/internet4-20) until all your items have been selected. Review your shopping cart and check out. The checkout process will take you through the regular Amazon checkout process. There are a few different ways to search for your item other than the search box on our page. 1. You can also look�on theAmazon homepageand find the item you wish to purchase. Copy and�paste the item title on theI4C shopping pageand change the category to fit the item.You may also wish to open two browser windows and do this side by side to make it easier to paste in the items. 2.��You can�also select a category first and then do a general search to see various products to purchase. Build your cart using the Internet4Classrooms associate site and approximately 6% of the sale becomes a no-extra-fee commission to help Internet4Classrooms pursue its educational mission. Help us keep doing what we do every day - finding free amazing resources to make your teaching experience inspiring and simplified. 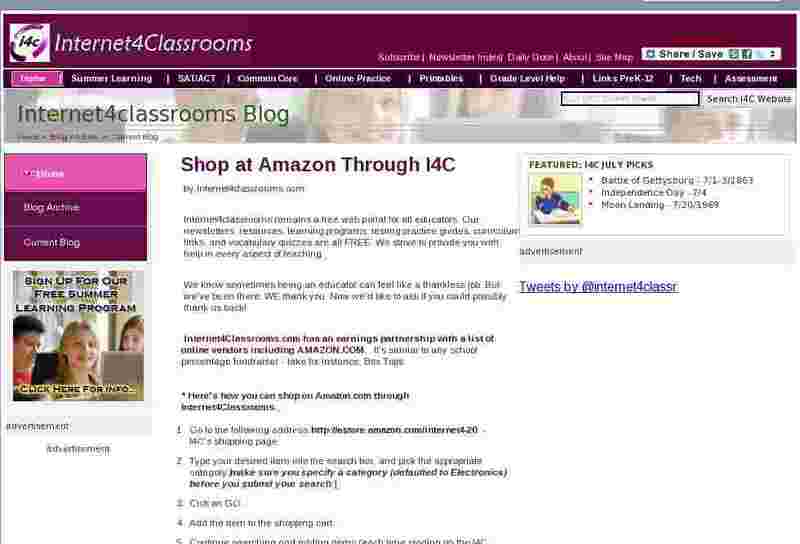 Bookmark I4C's AMAZON page with complete instructions. **Disclaimer:You may find that some items (non-commissionable or not stocked by Amazon) may not be available, or available at the price you wanted.� Any Amazon prime eligible items will still be shipped via Amazon prime - that will not show up until you are performing the regular Amazon checkout process. We also partner with Barnes and Noble, Discovery, Buy.com, Nickelodeon, Discount School Supplies, Highlights, CompUsa, Discount Party Supplies, and more!Find links to all of our shopping partners here.